Benny Jones (left) with Lionel Batiste and the Treme Brass Band. Photo © Matt Sakakeeny. Benny Jones is a founding member of both the Dirty Dozen Brass Band (on bass drum) and the Treme Brass Band (on snare drum) and has been an important part of New Orleans’ brass scene since the 1970s. Jones formed the Dirty Dozen in 1977 with former members of the Fairview Baptist Church Band, incorporating funk, soul, and R&B tunes alongside parade standards. 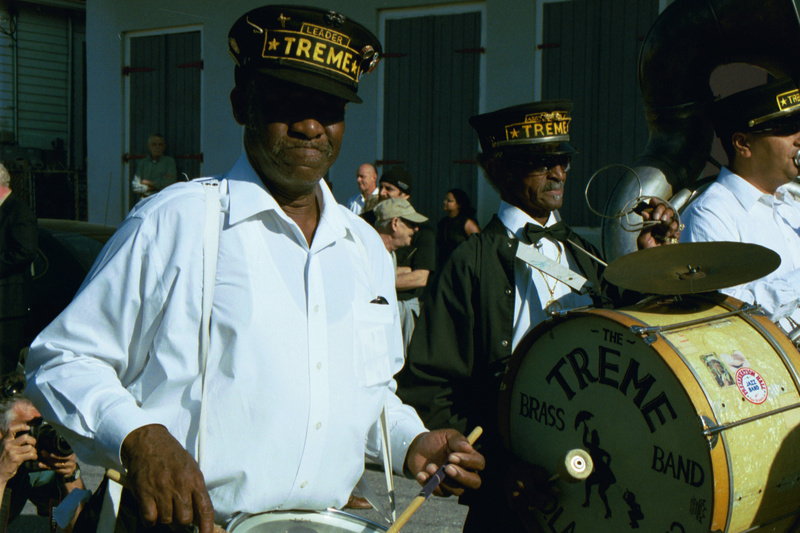 After leaving the Dirty Dozen in the early 1980s, Benny established the Treme Brass Band in the early 1990s. Unlike the Dozen, the Treme Brass Band focused on more traditional repertoire and instrumentation, often incorporating spirituals and sometimes featuring the clarinet, an instrument seldom heard in contemporary brass bands. Treme band members also wear the iconic black and white dress uniforms when parading. In addition to his work with these two brass bands, Jones also coordinates the music for the annual Black Men of Labor second line parade. In keeping with the traditional focus of the club’s parade, Jones ensures that musicians wear black and white uniforms and play traditional repertoire.